Hover to Zoom DKV5651 Vision Development Kit Based on Micro/sys' SBC5651 single board computer (SBC), the DKV5651 Vision Development Kit is ideal for system developers who need an SBC camera solution with fully integrated hardware and software. The DKV5651 brings our SBC5651 together with a performance appropriate CSI camera so users can experience a fully functional vision target system that runs right out of the box. The DKV5651 consists of credit card-sized SBC5651, a 24-pin CSI camera sensor module, cables, and an integration layer of firmware. OEM users will find the DKV5651's seamless integration enables implementation of vision applications without the headache and manhours required to get a SBC, camera sensor module, vision software, and cabling to all play together. 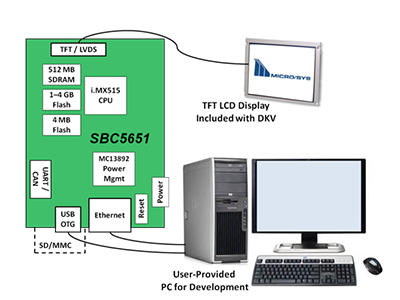 Micro/sys has provided embedded users with integrated SBC packages for over 35 years. 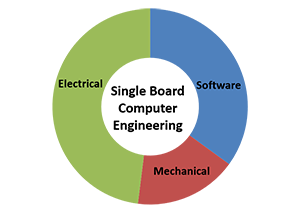 We understand that the key to empowering embedded system designers lies in providing useful software tools and firmware layers that reduce or eliminate tedious integration tasks--freeing up time better spent writing application-specific software. Our SBCs come with Linux or WindowsCE BSPs so you can be programming in your favorite operating system in no time at all. Micro/sys offers other, more powerful cameras with faster SBCs so you can pick the vision system best suited to your application. We invite you to view other Vision Development Kits by clicking here. 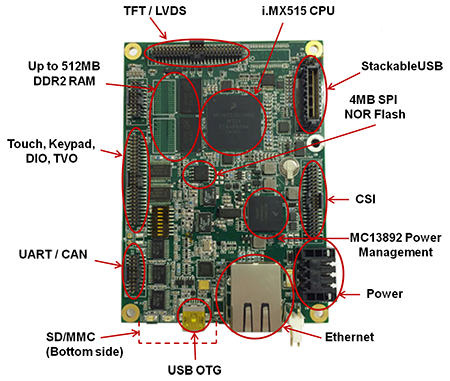 The rich offering of video and multimedia features in Freescale’s i.MX515 ARM® Cortex®-A8 processor enhances the value of the SBC5651's CSI camera module. The CSI port can acquire video at a rate up to 60 frames per second and moves it to the SBC5651's DDR2 memory for processing. Real time video is piped through the on-board GPU to the LCD touch screen for viewing or to Ethernet for transmitting. The video can also be stored directly onto the SBC5651's flash dirve (4GB SD card). Software controls allow image sampling for applications where streaming video is not needed. 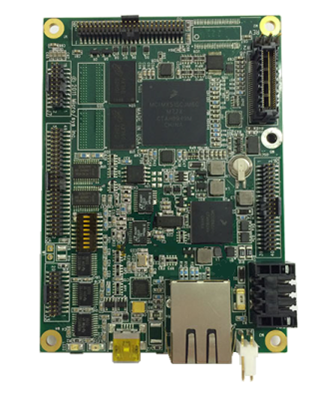 The memory subsystem on the SBC5651 consists of up to 512MB DDR2 SDRAM for application data and 4MB SPI NOR flash for the bootloader and operating system. Depending on system needs, the NAND flash can be used for the operating system or for non-volatile user storage. Consuming less than 1W of power, the SBC5651 is ideal for handheld applications. 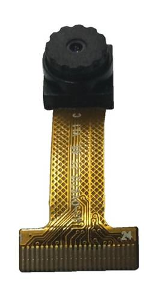 Users are provided three selectable power-source options to match their application: 1) standard 5V power header from a system power supply, 2) rechargeable single cell Li-Ion battery, or 3) power through USB via a mini-AB connector, or 4) StackableUSB connector. Supported serial interfaces include four (4) USB ports, three (3) serial ports, 10/100 Ethernet port, CAN, SPI, and I2C. 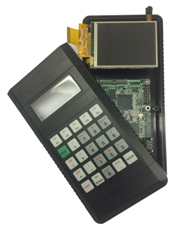 Other on-board I/O includes TV OUT, audio-in, (1) SD/MMC card slot, (23) GPIO, RTC, keypad interface, and more. USB, Ethernet, power, and the SD/MMC ports use standard cables eliminating the need for costly breakout boards or custom cables. The optional StackableUSB I/O expansion port with USB, I2C and SPI serves as a bridge to a wealth of off-the-shelf industrial I/O including A/D, D/A, modems, GPS, sensors or user customized embedded I/O. 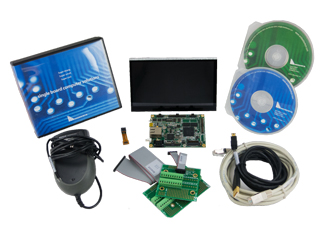 The standard SBC5651 Development Kit comes with a Linux image preloaded on an SD card, providing users with a "run-out-of-the-box" experience. Step-by-step instructions are included (see diagram to the right), along with instructions for building aflash image to run out of flash in the final application. Users who wish to build their own flavor of Linux will find support for the SBC5651 through the Yocto Project. The Yocto Project, an open source collaboration project, provides templates, tools and methods to assist users in creating their custom Linux distribution. Adopting the Yocto approach now sets you up with a next generation environment for embedded Linux. Regardless of your embedded system needs, Micro/sys has a BSP to match your skills and system needs. DKV5651 provides tools to simplify your embedded vision applications. CSI Camera Sensor Integration: Drivers, camera sensors, lens, and cables/connectors are included in the DKV5651, providing a plug-and-play experience with the installed BSP. All components are fully integrated and detected at power-up, running a video display from the camera with little effort. Vision Tool Kit Programming Platform: The BSP provided with the Vision Tool Kit contains an additional layer of Linux software for the SBC5651 ARM board so users can begin programming their vision application out of the box. Pre-integrated by Micro/sys, open source software along with well documented sample programs written by Micro/sys are available to the user immediately. The tools, some originally developed for Windows/Intel environments, run seamlessly on the SBC5651 ARM/Linux platform. Micro/sys sample programs assist users implementing image processing operations such as edge detection, optical character recognition (OCR), and color analysis. Some sample programs show users how to use OpenCV, a large and active vision commmunity of open source software which includes over 250+ pre-tested and validated image processing and vision algorithms, instructional tutorials on vision control plus a wealth of "how to" information for implementing vision applications. GStreamer, a video processing tool, based upon pipelines, is also accessable and helps create different types of multimedia applications such as video editors, streaming media broadcasters and media players. NEON GPU: Micro/sys' SBC5651 incorporates NEON technology from the iMX5 for embedded programmers. NEON works seamlessly through its own independent pipeline and register files to accelerate multimedia and signal processing algorithms in order to provide an enhnaced user experience. NEON, supporting multiple formats, multimedia codecs and functions, can be customized by the user to enhance an applications multimedia output. The make-vs-buy decision for your single board computer (SBC) is one of the most critical decisions you will make for your project. The knee-jerk reaction often is, "I can make this for a fraction of the price". Or, “I know a cheap DIY board that will do the same for a lot less”. 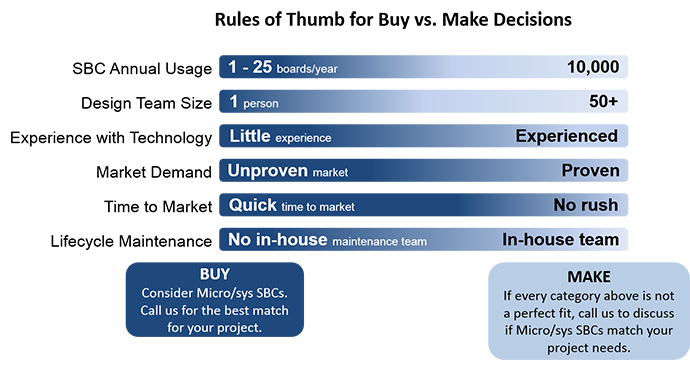 If the only criteria you’ll use to determine a make-buy decision is comparison of BOM costs, then making an SBC or buying a DIY board will appear more economical. However, Micro/sys' 35 years of experience with thousands of customers has shown us there is no getting around the true "Total Cost of Ownership" of a circuit board assembly. We know a simple BOM cost comparison overlooks many of the hidden costs in manufacturing a SBC. Today's embedded applications, either microprocessor or microcomputer, are complex. Implementing such an application requires specialized, niche expertise from multiple technology areas. For the typical SBC OEM, having such a breadth of expertise on staff is not feisable. This is the true value of having a single board computer vendor you can work with easily: deep, specialized technical know-how. Below is a list of some of the factors we find are frequently overlooked as OEMs plan a SBC design project. We also provide some of our own “rules of thumb” guidelines which might prove useful as you decide how to implement your embedded application. 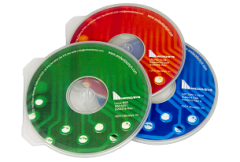 Micro/sys products come with complete documentation for user operation. Below is a list of the technical information for the SBC5651 including User Manual, product specifications, white papers and compatibility information. The SBC5651 User Manual includes a "Getting Started" section aimed at familiarizing users with the product and is written to help the first time user bring up the development enviornment for the board. Micro/sys provides technical support for all our products through our email tech support at techsupport@embeddedsys.com. For your convenience, Micro/sys offers a selection of standard accessories which we have tested with our products and found to be helpful in bringing-up embedded applications. The items below make one-stop-shopping easier and can provide a smooth development cycle for your project. The items listed below can be added to your order or you may add them to your request for quotation to get pricing information.